Having recently read Caroline Alexander’s The War That Killed Achilles: The True Story of Homer's Iliad and the Trojan War, a wild hare came into my head to read Aeschylus’ Persians, which was mentioned in some connection with the book. My exposure to Greek playwrights is limited. In my infamous graduate-school days, my exposure to Greek authors comprised the historians and relatively obscure Byzantine chroniclers; I had done little reading – much less serious reading – of the literature. This volume contains four of the seven complete plays from Aeschylus’ work (somewhere between 70 and 90 plays, of which only fragments have survived the ages): Persians, Seven Against Thebes, Suppliants, and Prometheus Bound. Persians: None of these plays are “plays” in what most people expect from that word. There’s little action or plot, and much recitation between chorus and actor. Persians is unique in a couple of ways. 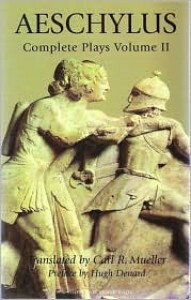 It’s the only first-hand account of the battle of Salamis (the playwright was there) that has survived, and for a play presented to an audience of Athenians it presents the enemy in a surprisingly sympathetic light (remarkably so, considering that Salamis was only about a decade in the past when first performed and many in the audience would have been veterans of the war). It is – above all – a cautionary tale about the perils of hubris. In attempting to invade Hellas, Xerxes has overstepped the bounds of what is permitted to humans and he and all of Persia must pay the price – defeat, humiliation, ruin. From Susa they went, / from Agbatana, / from Kissia’s ancient, towering ramparts, / by horse, by ship, by foot, / in close-ranked columns of war. / Men like Amistres and Artaphrenes, / Megabates and Astaspes, / each of them kings, / Persian commanders, / but each of them also the Great King’s servants, / marshals of Persia’s massive forces, / surging, surging, / seething for battle, / archers, horsemen, / a sight to see, / fearful in the fight, / stern in the harsh resolve of their spirit. King! / My King! / I lament for your army, / your noble army, / for the greatness of Persia, / and her glorious men, / cut down now, / cut down, whom / god has destroyed! The land, / the land cries, / cries aloud, / cries, / for her youth whom / Xerxes has / slain, / whom Xerxes had crammed into dismal / Hades, / Persia’s / youth from Agbatana, / great Persia’s flower, / many, many, / thousands, / ten thousands, / archers, / masters of the bow, / a forest of men, / gone, / destroyed, / no more! Seven Against Thebes: Before I learned the actual story behind the title, this play always brought to my mind a Greek version of “The Seven Samurai” (or at least “The Magnificent Seven”). The reality, for me, wasn’t quite as inspiring. Eteokles and Polyneikes are the brother-sons of Oedipus. The original plan was for the brothers to alternate in the kingship of Thebes but after Eteokles’ first year, he refused to give up the throne and exiled his brother. Polyneikes goes to Argos, where he convinces King Adrastos to help him take the city. Adrastos recruits five other champions and they lead an army against Thebes. Everyone but Adrastos is fated to die in this war, the brothers as part of a curse on Oedipus’ house, as well as a fulfillment of the father-brother’s curse on them for mistreatment. In its “raw” form, there’s really no side to prefer but in Aeschylus’ hands, you’re urged to root for Eteokles, who is presented here as the epitome of (martial) arête and good kingship – not only does he fulfill the demands of honor but he truly cares for the fate of Thebes and dies knowing that his defense of the city will save it from the horrors of a sack. O god-hated house of Oedipus, / house cursed by the gods, / house maddened by the gods, / house of tears, / now the curse of Oedipus is fulfilled! But no time for tears or wailing now, / giving birth to even worse suffering! As for him, / Polyneikes, / so well-named, / strife-bringer, we will / see if his sign is fulfilled; whether golden / letters on a shield will do what they say; / or are they the babble of a demented mind? If Justice, virgin daughter of / Zeus, had ever been with him in / thought or deed, his boasting might have come true. Suppliants: This play is the least satisfying from a self-contained-story point of view. It sets up a confrontation between the fifty daughters of Danaos, who do not want to marry against their will, and the demands of Greek culture, which says a girl must wed. It must be remembered that all of these plays were part of dramatic trilogies and a satyr play (a comedy). Suppliants is the first in an arc that explored the myth of the Danaids. It’s as if we only had a copy of “The Empire Strikes Back” and maybe a frame or two of the other movies. We could comment favorably on the movies’ technical mastery and script but we wouldn’t know much about the characters or why Vader’s admission of paternity is so pivotal. Prometheus Bound: Prometheus Bound is the most play-like of these plays. The characters are strongly delineated (Hephaistos, Prometheus, Oceanus, the First Daughter, Io and Hermes) and, while no action takes place on stage, the monologues are harrowing enough in the tales they recount, and the finale when the Titan is hurled down into Tartarus is as violent as any an action-film lover could wish. The story should be familiar to most readers: There is a war in heaven between Zeus’ faction and that of his father, Kronos. Prometheus & his mother Themis, though Titans and initially Kronos’ allies, defect to Zeus and allow his side to prevail. But Zeus, in this play, is a tyrant who can brook no competition. When Prometheus gives to Man not alone fire but all the arts of civilization, Zeus condemns him to perpetual torment, chained to a cliff in the Caucasus. The play is a deconstruction of tyranny and the proper response of a free man. Hephaistos and Oceanus are the men who go along to get along (courtiers and sycophants), Io is a living victim of tyranny (raped by Zeus and driven mad by Hera’s jealousy), and Hermes is Zeus’ Gestapo (spying on the sky god’s subjects so that no rival can arise).